The future of fintech is right there in the name. New technologies are being released at such a rapid pace that it can be difficult to keep up with them. That’s why we’ve done the hard work for you and investigated a few trends that have the potential to drive the industry into 2018 and beyond. Fintech is still red-hot. Mega-corporations and startups are pouring money into Fintech investments. It’s estimated that startups could capture up to $4.7 trillion in annual revenue and $470 billion in profit from established financial services companies, according to Goldman Sachs equity research report. They’re embracing the agility and flexibility promised by Fintech solutions to help people manage their money in new ways. While incorporating new financial technology creates risk, proactive executives can find a wealth of opportunity to use risk to create value. Startups are fighting off increasing competition from the larger firms that are finally adapting to new technologies. As for customers, they have embraced the idea of on-demand finance, thanks to mobile and cloud computing. 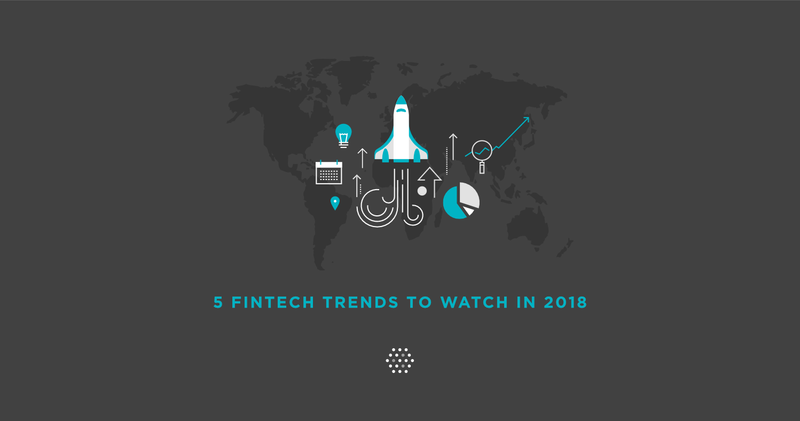 Fintech trends show that people are more comfortable managing their money and business online. They’re less willing to put up with the sometimes glacial pace and bureaucracy of certain traditional financial services. No mention of cryptocurrencies is complete without a mention for Blockchain, the technology that underpins it all and makes it all possible. Blockchain actually dismisses the need of a central intermediary to do asset transfers. They aren’t limited to money. They could be titles, vehicles, home sales, etc. “Let’s talk more about Blockchain technology, and its enablement of peer-to-peer transactions,” says Santhana, naming Blockchain as a Fintech trend. This technology has much wider applications including in the field of healthcare, where it could be used to store health records. But equally, it also has plenty of potential to further disrupt the finance market. For example, it could change the way that houses are bought and sold because each property could have its individual record in a Blockchain without a bank role. Taking advantage of Blockchain technology, nami.trade opens up a trading platform which is transparent, decentralized, anonymous and 100% automated. As a result, the transaction costs can be reduced 100 times when compared to traditional trading platforms. nami.trade is now one of the key products in the ecosystem of Nami Corp. The Fintech industry is deriving so fast that regulators are struggling to keep up with it. But like taxes, regulation is important and we’re likely to see larger governing bodies placing increased emphasis on the regulation of both software and hardware. Let’s face it, the financial industry is a high-profile industry that demands the utmost security. US regulators are actively watching but giving space for the players to figure things out. Still, rising regulation doesn’t have to be a bad thing. In fact, utilized correctly, regulation will make the industry stronger and more secure, increasing consumer assurance. And if consumer confidence is high, we can expect to see a corresponding growth in the Fintech industry. The demand will drive the supply. Startups have a little regulatory scope, but it’s so far that they can go solo with their own platform. Establishing industry alliances is one fintech trend that can help bring new technologies to broader adoption and solve implementation problems. Reaching out to other companies and finding areas to heat up together can cultivate merits and improve customer experience. It can also help the technology become more mature. In one instance, Accion partner DemystData worked with a large Philippines-based bank to expand credit products to customers with little to no formal credit history. Their partnership has helped the bank verify customers in real-time and assess credit risk, all while learning more about how to tap online, social, and external data to make better decisions. Cryptocurrencies have become big business throughout the last twelve months, with Bitcoin increasing dramatically. Because of that, there are also plenty of people projecting cryptocurrencies of their own through ICOs (Initial Coin Offerings). Consumers and financial professionals have more choices than ever before when it comes to which cryptocurrency to place investment. Nami Crypto (NAC) is a cryptocurrency that can operate throughout the Nami ecosystem under Smart Contract. NAC will act as the trading currency for transactions in EURUSD, GBPJPY, GOLD, OIL, S&P500, DAX, BTCUSD, ETHUSD, BTCETH, NACUSD, BTCNAC, XRPUSD, XRPNAC, etc., and more than 3,000 other instruments to choose from. NAC is used to create and develop a safe and secure exchange to help investors make transaction at any time without Spread, Swap, Commission. nami.trade also support multi-platform and is broadcasted to be the future of Binary Option (more than 95% pay-off), Forex markets,etc. This project is a platform that’s backed up by the whole Ecosystem to help investors and traders around the world to utilize their experience and their money too.